Tunisia is known for the diversity of its scenery and environments where so many different products are collected, produced and exported. Along with the famous Tunisian olive oil, honey is a local product that is made differently throughout the country. The techniques and the flavors are different from one producer to another. The city of Sidi Alouane in Mahdia organizes the 29th edition of the National Honey and Heritage Revival Festival from July 27th to August 12th to highlight the diversity of the local products in Tunisia. Visitors will feel welcome right away with a big colorful carnival with the music and traditions of the region. 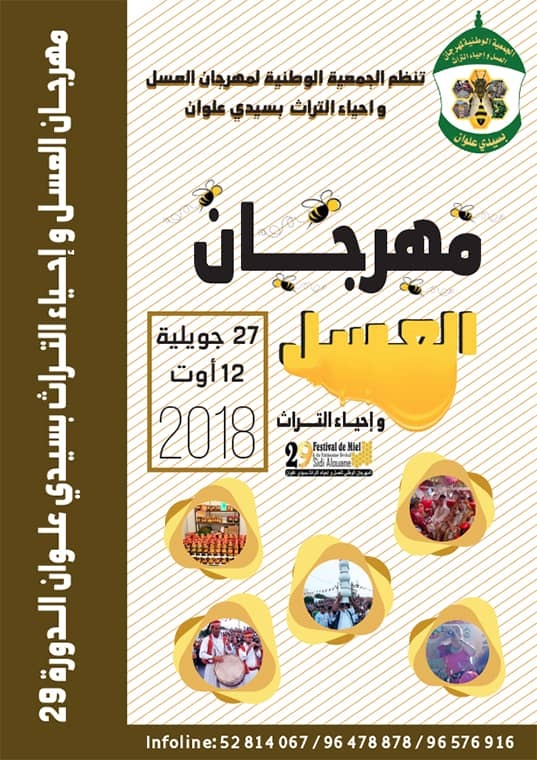 Beekeepers from the 24 Tunisian governorates will display their various products. They will also discover the different techniques used by the farmers. Not only that, they will also try other local products such as jam and sweets. The festival is the place to be if you want to taste all the Tunisian local products in one place. Crafts and arts will also be displayed throughout the event for an artistic touch to the traditions. Other activities are also on the agenda; the art shows for children and adults, music concerts with Tunisian singers like Balti and Walid Ettounsi, traditional music shows, expositions and many more. During 15 days you will be immersed in a world of traditions where visitors will try a variety of local foods, discover art and attend the different musical and cultural shows. They will also be seduced by the warm welcome offered by the local community and the great weather in Sidi Alouane.